Read All about World Tumor Day, Why, When, Aim of this day. World Brain Tumor Day is celebrated annually on 8th of June. 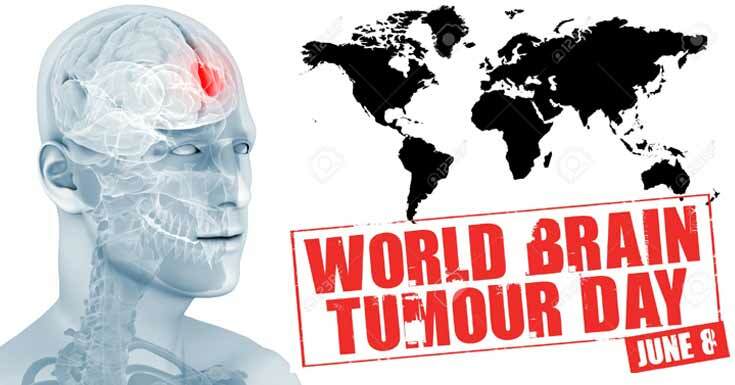 World Brain Tumor Day is aimed at raising awareness about brain tumor and educating people from all sections of the society about this kind of cancer which is not very common. The day is also meant for people who are suffering from brain tumor and help them deal with the condition in a better and more effective way. Brain tumor occurs in brain cells, which multiply in an abnormal way or way in which it cannot be controlled. The tumor can be cancerous of non-cancerous. Depending on the tumor's location, how fast the cells are multiplying and at what pace they are spreading to adjacent areas, the tumor is given grades from 1 to 4. World Brain Tumor Day was started by German Brain Tumor Association, a non-profit organisation which provides all necessary information and support to brain tumor patients. The association announced World Brain Tumor Day on June 8, 2000 -this day set footprints for international commemoration of World Brain Tumor Day. The German Brain Tumor Association was found in 1998. Ever since then, as many as 500 members from 14 nations have registered in the association. The association gets encouraging and willing support from brain tumor patients, their family members and top medical professionals and medical organizations from across the world. World Brain Tumor Day is celebrated in order to draw attention of the common public towards the cause of brain tumor. The idea is to include politicians, businessmen, medical and research institutions in the importance of funding research and development work which is done for brain tumor. This is important in order to come up with more effective treatments that are affordable for one and all. On World Brain Tumor Day, awareness is raised about the causes, signs and symptoms of brain tumor. Through awareness campaigns, events and discussions, people are made aware about the important facts about brain tumor along with concerns which are important for brain tumor support groups. People who are suffering from brain tumor are encouraged to join support groups which can help in reducing stress associated with the illness. The support groups share the challenges faced by brain tumor patients during treatment. They also provide hope and encouragement to brain tumor patients. On this day, brain tumor patients are encouraged to research more about their condition. This helps them cope up with it at ease. Some awareness campaigns also raise funds in order to assist patients who are struggling to pay hospital bills for treatment of brain tumor.